There is no doubt that Alaska is a playground for adventure seekers. In sub-zero temperatures or under the midnight sun, Alaskans are never scared to gear up and head outdoors for some thrills. From paragliding to packrafting, hobbies in the 49th state are as extreme as the weather! Turnagain Arm, one of the narrow branches of Cook Inlet located in Southcentral Alaska, has one of the biggest bore tides in the world. And despite its frigid waters year-round, it’s a summer hot spot for local surfers. A bore tide occurs when the incoming high tide rushes into a narrowing channel of water, creating one long wave that slowly rolls parallel to the shore – perfect for an extended ride on a surfboard. Although the tide happens every day, the largest bore tides occur within days of the new and full moons. The waves can reach up to 10 feet tall and can travel at speeds of 10 to 15 miles per hour. 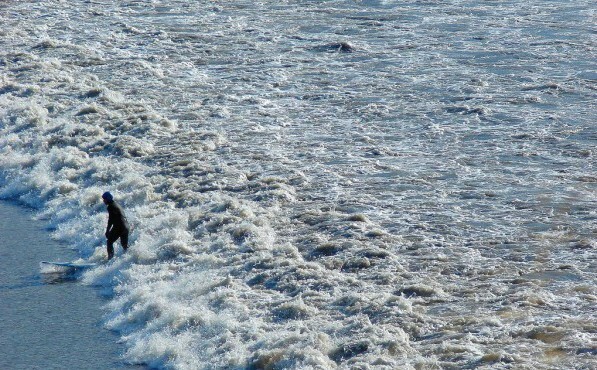 Drive down the Seward Highway just south of Anchorage on a nice day and you’ll see surfers decked out in heavy-duty dry suits ready to ride the tide. It’s such a good show that many people pull their car over to the side of the road to watch. A little snow never stopped an Alaskan! Biking in the 49th state happens year-round, with popular “fat bikes” that are specially designed to roll over soft snow. With tires up to five times as wide as standard road bike tires, fat bikes can navigate trails and snowy terrain as well as cross-country skis. Fat biking has increased in popularity over the last few years and many Alaskans even ride them to work throughout the winter season. If you’re interested in joining the locals on the snowy trails, fat bikes can be rented at bike shops across the state, including Far North Fatbikes in Fairbanks and Arctic Cycles in Anchorage. Packrafting is an entirely unique way to see Alaska, combining elements of rafting, hiking and backpacking. Packrafts are light, inflatable rafts that are small enough to fit in a backpack when deflated. Most packrafts are designed to carry one passenger and are rugged enough for the most challenging rapids. Plus, they can be carried anywhere in Alaska for an exciting adventure. Like most extreme hobbies, packrafting requires outdoor safety skills, a certain level of knowledge and an understanding of the terrain and water bodies of Alaska. Ever dreamed you could fly? Paragliding is the closest you may ever get to it. It’s a hobby that requires a lot of practice, but the payoff is out of this world. Paragliders sit in a harness suspended below a fabric kite, or wing, and use only air pressure to glide through the breeze for periods of up to many hours. Mount Alyeska in Girdwood, only 45 minutes south of Anchorage, is a popular spot to take off in the summertime. Paragliders can ride a tram to the top, where they strap into their harness, get a running start and literally leap off the mountain. Using air pressure to navigate themselves, they soar over the valley enjoying stunning views of the Chugach Mountains and Turnagain Arm. When paragliders are ready to land, they descend slowly into an open space and touch down on their feet. Interested in trying one of these extreme hobbies on your next Alaska vacation? Reach out to a local outfitter or guiding service and you may just discover a favorite new hobby! But be careful, this is how many residents of the 49th state ended up calling Alaska home.